For the first time, WELTEC will showcase the efficient slurry and digestate processing system“Kumac“. The fully automated processing system “Kumac“ reduces the liquid manure and digestate volume by 50 percent. Energy decentral: Weltec Biopower to present slurry and digestate processing system "Kumac". WELTEC BIOPOWER will present its comprehensive portfolio of proven and innovative anaerobic digestion technologies and services at the Energy Decentral in Hanover, Germany (15 - 18 November 2016). The biogas manufacturer‘s experienced team will be on site to welcome visitors at Stand D 11 in Hall 25. For the first time, WELTEC will showcase the efficient slurry and digestate processing system “Kumac“. 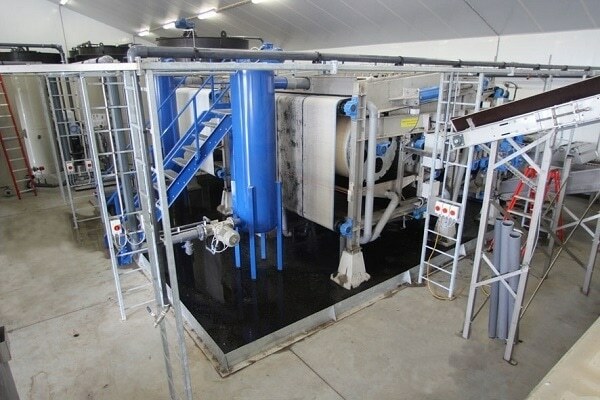 The fully automated processing system “Kumac“ reduces the liquid manure and digestate volume by 50 percent. In a four-stage procedure, clear water, liquid fertiliser concentrate and valuable solid matter are extracted from the source material. The processing system represents a sustainable, economic solution for mitigating the impact of the nutrient surplus by reducing the volume of slurry and improving its transportability. The Kumac technology has already been successfully used in the Netherlands and Belgium for several years and has been praised in independent studies. Furthermore, WELTEC will give visitors recommendations as to how they can optimise existing biogas plants. Based on a thorough analysis of the respective framework conditions, the biogas specialists will prepare a custom-tailored concept for the improvement of the plant performance – regardless of how old the plant is and no matter whether waste or agricultural substrates are used. With expertise gained in the establishment more than 300 biogas plants in 25 countries over the past 15 years, WELTEC is not only specialised in plant construction, but also in plant maintenance. At the Energy Decentral, visitors can get information on WELTEC‘s comprehensive services in the fields of CHP units, engineering mechanics and biology. With its 24/7 availability and its internal lab, the German biogas specialist ensures successful biogas operation on a long-term basis. Additionally, WELTEC will show fair visitors the MULTIMix, which continues to be in high demand around the globe: The retrofittable liquid input system for biogas plants reliably shreds fibrous feedstock and separates foreign matter. It thus enables operators to make use of alternative substrates, thereby ensuring flexibility, technical stability and sustainably economic operation of biogas plants. Visitors can get further information on all innovations, technologies and services at the Energy Decentral / EuroTier from 15 to 18 November 2016 at the WELTEC BIOPOWER stand (Hall 25, Stand D 11).